George Shelley Photos, News, and Videos | Just Jared Jr.
It’s been months since George Shelley left Union J, and he’s opening up about what happened in a new interview. On always knowing his orientation: “I think I always knew, I just became more comfortable with it. At that point I was coming out of the band and standing on my own two feet. I would never come out as gay. I wouldn’t put a label on it because I do like girls, I’ve fallen in love with girls and I could never close that off. George Shelley is all smiles as he walks the carpet for the Star Trek Beyond premiere held at Empire Leicester Square on Tuesday (July 12) in London, England. The 22-year-old radio personality was joined by actress Dakota Blue Richards and former Union J bandmate JJ Hamblett. George left the band a few months ago and Union J has since replaced him with Casey Johnson, who seems excited about the group’s new sound and songs. “I literally can’t wait for you guys to hear the new @UnionJworld sound,” Casey wrote on Twitter earlier this week. Tom Daley and his fiance Dustin Lance Black arrive for the premiere of Finding Dory held at Odeon Leicester Square on Sunday afternoon (July 10) in London, England. 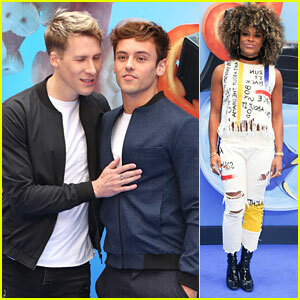 The 22-year-old Olympic diver and filmmaker Dustin were joined on the blue carpet by singer Fleur East and radio personality George Shelley. Tom is gearing up for his second Olympic Games in Rio and shared his excitement on Twitter. “Just over a week now until we leave for the Olympic Games! !” he wrote. George Shelley & Ella Eyre Check Out 'Ab Fab: The Movie' in London! George Shelley looks dapper in his tux while attending the world premiere of Absolutely Fabulous: The Movie on Wednesday (June 29) at the Odeon Leicester Square in London, England. Also in attendance at the event were singer Ella Eyre and model Jourdan Dunn. “FEELING AB FAB FOR THE AB FAB PREMIERE TONIGHT,” Ella captioned a photo of herself on the way to the event. “Grew up watching this with Nan, never would have imagined this…” George said about attending the premiere. FYI: George is wearing a Moss Bros outfit with Tom Ford glasses. The Vamps pose for pictures backstage at the 2016 Capital FM Summertime Ball held in Wembley Stadium on Saturday (June 11) in London, England. The guys – Brad Simpson, James McVey, Connor Ball, and Tristan Evans — joined Louisa, Clean Bandit, Jess Glynne, George Shelley and Zara Larsson at the event. Earlier in the day, Louisa, The Vamps and George took to social media to express their condolences over the passing of Christina Grimmie. “Can’t even believe what’s happened. One of the nicest people in the industry and in general we’ve ever met. So unfair. #RIPChristina,” Connor wrote. Wow RIP #ChristinaGrimmie so sad ?????? Little Mix looks gorgeous as they arrive on the red carpet at the 2016 Glamour Women of the Year Awards on Tuesday (June 7) at Berkeley Square in London, England. The ladies — Perrie Edwards, Jesy Nelson, Jade Thirlwall and Leigh-Anne Pinnock — joined a host of celebs at the event where they picked up the Best Music Act honor. Also in attendance were Sophie Turner, George Shelley, Jess Glynne, Eleanor Tomlinson and Jenna Coleman. FYI: Sophie is wearing a Kenzo dress and a Jennifer Fisher necklace. Jess is wearing a Roksanda dress.